Citizens protest the Atlantic Coast Pipeline. Learn about upcoming public hearings and other opportunities to engage in the permitting process for the Mountain Valley and Atlantic Coast pipelines. 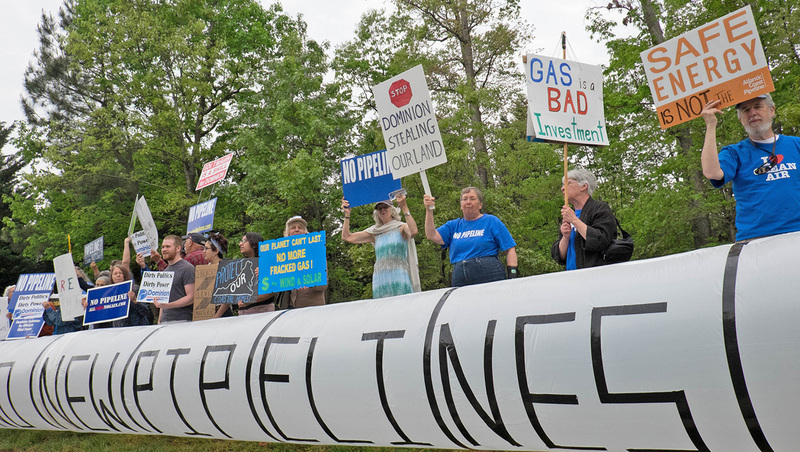 The Federal Energy Regulatory Commission issued its Final Environmental Impact Statement last week and, as expected, it gives a glowing review of the Atlantic Coast Pipeline. This is to be expected from an agency that has only denied two pipeline permits in its 40-year existence, which pipeline opponents have criticized for being a “rubber stamp committee” that doesn’t exercise its power to protect the environment or communities. The reality of the Atlantic Coast Pipeline, however, is a far cry from FERC’s rosy interpretation. In fact, we don’t have to search very far for a similar project that has failed to meet the conditions of the permit. The Rover Pipeline, although found favorable by FERC, has been plagued by problems. Technical experts, scientists and former regulators have been busy reviewing one of the remaining hurdles for this pipeline — the state water quality 401 certifications. Although the pipelines’ backers — primarily Duke Energy and Dominion Energy — are celebrating the release of the final EIS, the 401 permit is required before they can plow a 100-foot-wide scar down the eastern seaboard crossing streams, rivers and wetland ecosystems on the way. The public comment periods for the Atlantic Coast Pipeline is open in both North Carolina, Virginia and West Virginia. After the inadequate scrutiny of the Atlantic Coast Pipeline by federal regulators, it falls to residents of both states to speak out against the environmental impact and hold FERC, Duke Energy and Dominion accountable and to arm themselves with the understanding of the impacts the Atlantic Coast Pipeline will have on the region if it is allowed to move forward. Nearly 600 acres of forested wetlands in North Carolina would be cleared for construction of the Atlantic Coast Pipeline that could take up to 30 years to return to the existing mature state, creating long-term adverse impacts to the ecologic functions of those wetlands. The draft permit does not require any monitoring or reporting to ensure that wetlands actually remain wetlands and it describes the impact as being “temporary.” However, wetlands provide natural water filtration and protect and replenish surface waters. It would be expensive and difficult to build water treatment facilities to recreate the benefits the existing wetlands provide for free. The deforestation created by 75-foot-wide rights of way through wetlands will cause a loss of shade, more evaporation and life-threatening temperatures for animals such as fish, amphibians and aquatic insects that live in adjacent wetlands. This would mean severe damage outside of the effective right of way required for the pipeline. Had these grants not been returned, and the work performed, we would have three years or more of scientific data in the exact wetlands and type of wetland systems the Atlantic Coast Pipeline will impact. There also would have been additional staff support the 401 permitting program at little cost to the state. Instead, Tom Reeder’s ideological stance hamstrung DEQ staff and prevented the collection of vital information on groundwater, wetland health and species that could have directly assisted DEQ in evaluating the impacts of the Atlantic Coast Pipeline. So we’re left with Dominion’s and Duke’s promises to not cause harm. In addition to severe impacts to wetlands, the pipeline would impact rivers known to carry a wide variety of endangered, threatened or species of concern such as the Carolina madtom catfish, further impacting limited habitats of these species. Two federally endangered mussel species are found only in North Carolina streams that would be crossed by the Atlantic Coast Pipeline. Given the number of “listed” and “petitioned” endangered freshwater mussels and fish in water bodies crossed by the Atlantic Coast Pipeline, a far more detailed assessment of impacts on these species must be required. Streams and wetlands crossed by the Atlantic Coast Pipeline also flow into major river basins which are sources for the Pamlico-Albemarle Estuary, the second largest estuary in the United States. The estuary supports not only North Carolina’s fisheries but also many mid-Atlantic coastal fisheries. Impacts to any of these headwaters could negatively impact our fisheries and the economy of the state and the region. The Atlantic Coast Pipeline 401 application and construction detail fail to acknowledge the likely impacts of construction and pipeline operation on local groundwater or to ensure measures will be taken to prevent the impacts. For most of its length in North Carolina, the Atlantic Coast Pipeline would be located above the Northern Coastal Plain Aquifer system, which is especially vulnerable to contamination from the trenching and horizontal drilling processes because the aquifers are located at sandy, shallow depths. Given the large number of households within a half mile of the pipeline corridor that are dependent on well water, construction could impact many household water supplies. Included among the six major rivers and 34 water bodies the pipeline would cross are sources of drinking water for hundreds of thousands of people. The Atlantic Coast Pipeline includes or is adjacent to riparian buffers identified by the NC Riparian Buffer Protection Rule. As of July 11, DEQ reports they have not received a complete Sedimentation and Erosion Plan, so the ability to protect downstream water quality can’t be evaluated. During the directional drilling method of crossing, accidents often occur that would release drilling fluids into streams and wetlands, degrading water quality. These are often hard to locate and impossible to reverse. No project with the potential for violations of water quality standards on a short or long-term basis can be approved by the Division of Water Resources. The Atlantic Coast Pipeline would cross through seven North Carolina counties whose median income levels are lower than the state average. These counties have African American populations that are higher than the state average — the populations of two of the seven counties are over 50 percent African American. Three of these counties have Latino populations higher than the state average. The proposed pipeline may very well be the largest regional environmental justice threat in recent North Carolina history. Yet the final EIS from FERC made no effort to amend or address the fact that the draft environmental impact statement ignored this reality. An area where this discrepancy is of great concern is with predatory land agents and eminent domain, where private property can be bought for ‘fair compensation’ if it’s for public use. Land agents approach landowners along the proposed route and offer to buy the land for below market value with an implied threat that the landowner will receive a worse deal or struggle to match the resources and capital a major utility company like Duke Energy could employ for a legal fight. If that wasn’t enough to warrant serious investigation to environmental justice impacts, the Atlantic Coast Pipeline is proposed to run through four different tribal territories of the Coharie, Tuscarora, Haliwa-Saponi and Lumbee. About 30,000, or 13 percent, of the people who live within one mile of the proposed route of the pipeline in North Carolina are Native American, even though Native Americans represent only 1.2 percent of the state’s total population. Lumbee tribe member Ericka Faircloth, an organizer with Clean Water for North Carolina, says any impact the proposed Atlantic Coast Pipeline would have will be twofold as damage is done to tribal identity as well as to their sacred land. The threats to drinking water and the danger that trenching, horizontal drilling, blasting and potential leaks could have on fish populations are also felt at the terminal end of the pipeline. Jorden Revels, a student and Lumbee tribe member, claims that fishing as a primary food source is a reality for his community. On top of the environmental threats, there are also cultural dangers. Native Americans “didn’t have opportunities to learn how the route was chosen or to provide input on bodies of water or specific landscapes that their tribes consider sacred,” according to Ryan Emanuel, a Lumbee tribe member who serves on the environmental justice committee of the North Carolina Commission of Indian Affairs. Dominion Energy has projected a dramatic increase in electricity demand to the tune of 3,000 megawatts over the next ten years to justify the need for the construction of the Atlantic Coast Pipeline and associated gas-fired power plants. But modeling by PJM Interconnection, the regional grid operator, shows that projection is inflated and that current generation in the region is sufficient. The threat to wetlands, forests, communities and drinking water combined with the lack of demand is enough to justify the rejection of the Atlantic Coast Pipeline. Instead of sinking $5 billion dollars into what will almost certainly be a stranded asset in the coming decades, we should invest in clean energy jobs and generation. The Atlantic Coast Pipeline is not the kind of project we want for North Carolina now or in our future.